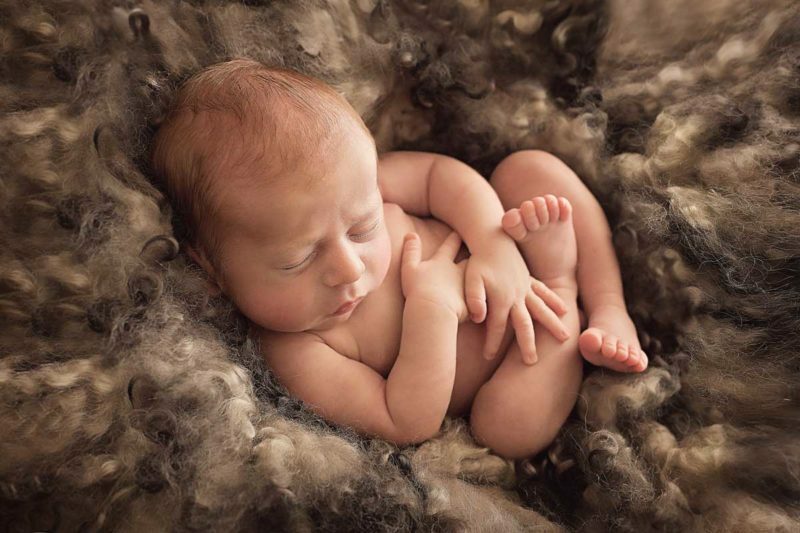 Newborn photography is a beautiful skill. Not only do you capture the first smiles and unique character of a newborn baby, but you also capture the most amazing details like little fingers, fine eyelashes, tiny toes. And these can’t be captured if you don’t use the correct posing, the correct lightning or you don’t have the patience to wait till the baby is settled and content so that you can capture the emotion, the uniqueness, and the parents’ love for they precious gift. These moments will pass; the baby will grow so fast, and these images will bring back the beautiful memories. There are lots of props that can be used, but the most important thing to capture is the beautiful and natural face of a newborn baby. Making sure that the baby is safe at any stage in the session is crucial, so don’t get overwhelmed if the baby is not happy in a certain prop or position: he will tell you what he loves, and that’s the most important thing: to be led by the baby. The parents will feel good knowing that their precious gift is in gentle and caring hands. The entire session day and feeling will be seen in the images; the gallery will be taken home, and these moments will be seen for years to come, so let’s make sure that they reflect the love and care for this little human, and let’s make the session a memorable session for the entire family. We talked about safety and what to look when looking for a newborn photographer in a different article. 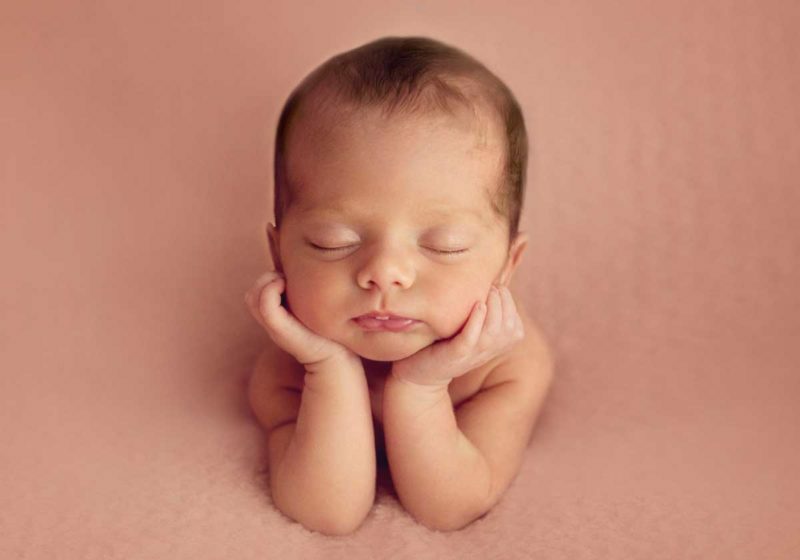 Now I want to talk about the specific positions of photographing a newborn baby. All these positions are safe and are supposed to avoid creating any discomfort for the baby. 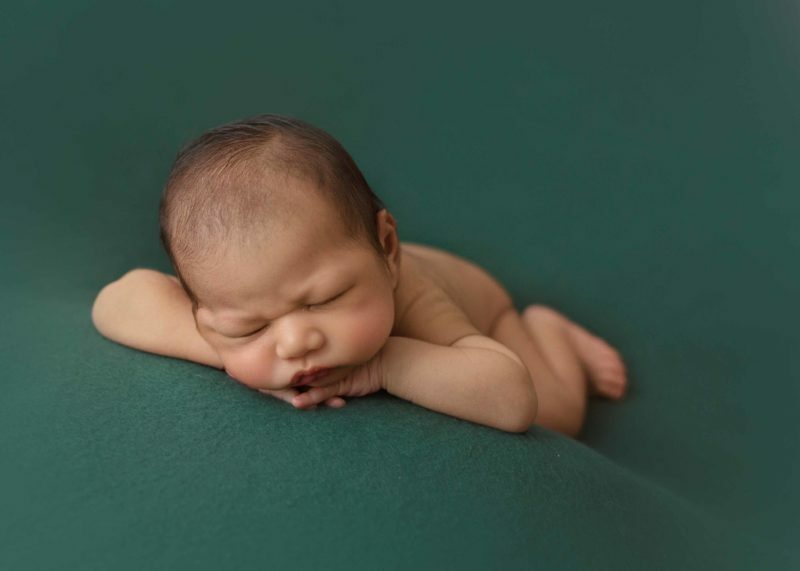 These positions have been researched and worked out in conjunctions with medical and birth personnel, as well as with professional photographers with years of experience in newborn photography. I can also say that I continuously participate in live workshops were the safety of the baby is the main focus. Now lets get started with the posing positions. The baby is placed on his back, and with the help of the posing pillows the legs and head are helped and curled in a way similar to the baby’s position in your womb. The legs and hands are folded over his tummy. In this position, with the help of lighting you are able to photograph the little fingers, toes, lips, the tiny button nose, the fine hairs. It is recommend to use a macro lens, parents will love to look at these tiny details. Baby is laid on his side and his little hands are placed under his face. You will capture his sweet face while sleeping in the most natural position. 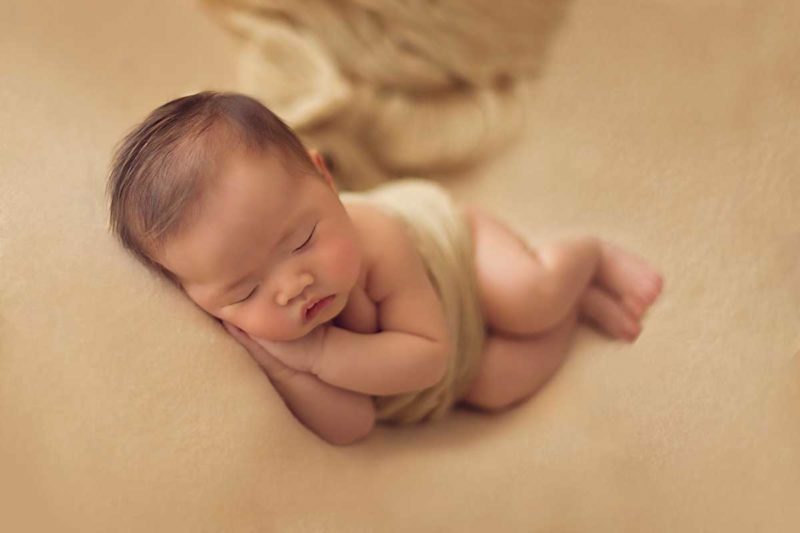 This position will photograph the baby in his entire length, the baby’s face will be in focus but his body will be in the foreground. The tiny baby is positioned with his hands under his chin. This position will accentuate his little shape and with the help of lighting you will be able to photograph the beautiful details of the lips. The baby can be dressed with clothes and you can use headbands or hats, I prefer more natural positions and minimal accessories. 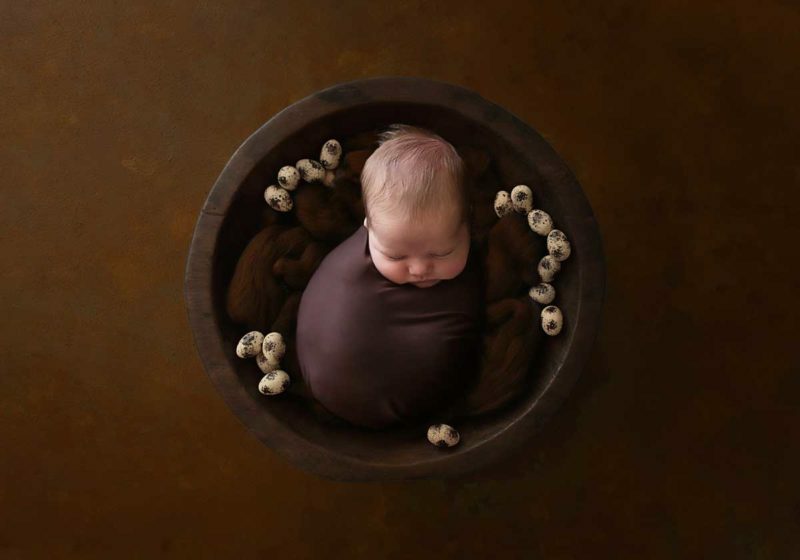 The same positions can be used using props like buckets, crates or bowls. When using these, a parent or assistant has to be close to make sure that the baby is safe at any stage. Also make sure that the edges of the props are covered to reduce the risk of the baby touching the edge. The baby is on his tummy with his elbow touching his knee. You can get this position on a bean bag or on different crates or beds. We are trying to accentuate the baby’s round shape as well as the baby rolls. Again, you can use scarves and different outfits, but for this position I do prefer the natural naked baby. Pretty much the baby is laid on the bean bag in a froggy position. This pose needs to he done with 2 frames or composite. The arms and hands under the chin need to be held by an assistant and the head will have to he held as well, to ensure that the baby is safe. This is such a great position if the baby has colics or tummy issues. This is my favourite pose. The baby is wrapped is a very cosy wrap. This is the time when I can use different wraps, flokati or diffrent toys. The beautiful baby is wrapped like a potato and he’s looking straight to the camera. He will fell safe as his entire body will be wrapped and secured so he can’t move to much. A spotter is a must during this pose. There are so many different styles of wrapping a newborn baby. You can leave his tiny toes out, you can wrap his entire body, you can use the wraps as decor. You can use different colour wraps as well as props like bowls, beds and baskets. This pose can be used for the wiggly babies. The baby can be fully wrapped, half wrapped or sometimes just the wrap around the baby’s body. You can place the baby on the back or on a side, you can bring his legs and hands out or you can keep them under the wrap. This position has so many possibilities and variation that your mind will never stop creating. As the baby is all wrapped is indicated that we can do the parents shoots also. The baby is cosy and it can be held by parents without the risk of baby doing any surprises. I love to do this shoot with siblings, where the baby will be placed in the arms of the brothers and they can gently hug their brother or sister. One of my favourite images is also when the baby is naked. I prefer to photograph this position over any prop shoot. 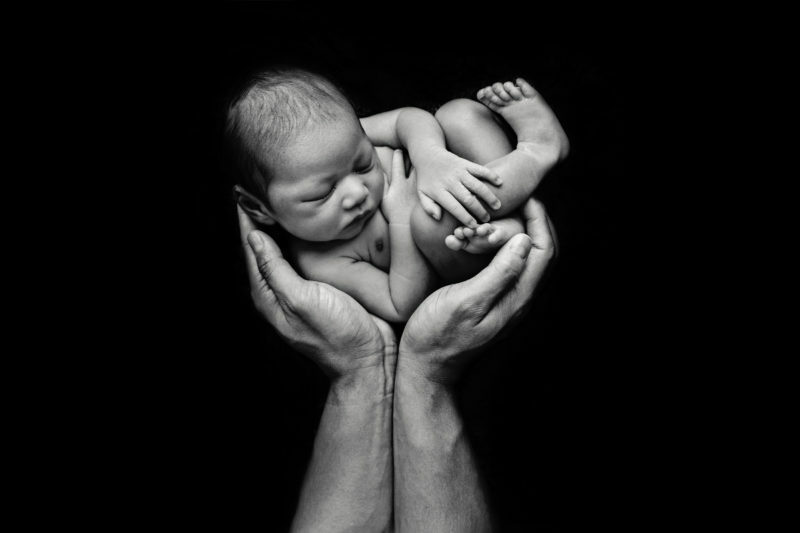 This position has the baby and one of the parents hands and is shoot in such a way the the baby looks like is held in the air. Here you can see the tiny size of the baby compared with the hands of the parents. Each of these positions are unique and special in their own way. I love the potato pose and the parent hands shoot. One day the little one can ask his father to lift his hands and show him how tiny he was. You don’t need to have a favorite pose; the important thing is to make sure that you capture the sweet smiles, the little details, the gentle shape of the baby’s body. 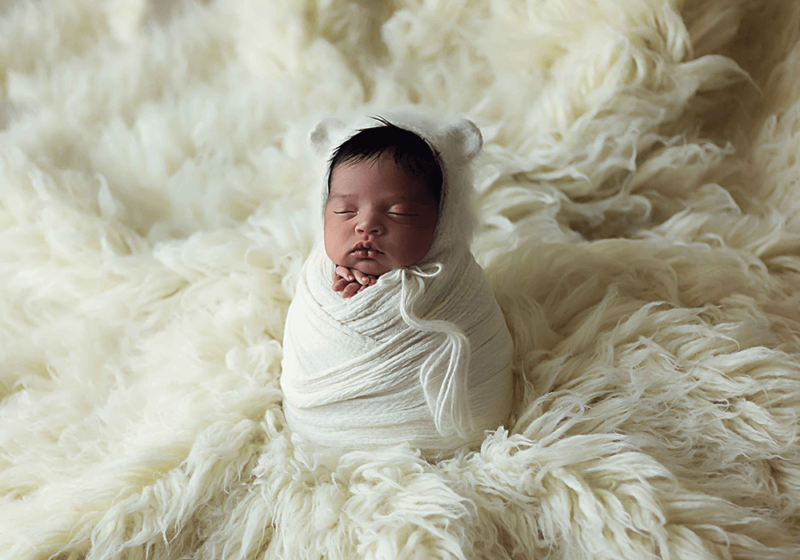 Through my images and my photography style I want to reveal the emotions and capture that uniqueness of the brand new baby. There is also one important thing to remember: there is a specific workflow I follow but I change and adapt each pose with the baby’s guidance. I listen to baby and if he doesn’t like being on his tummy then I change to side or back. Moreover, the most important thing in a session is to make sure that everything what you do is safe and that parents can rest assured that the session is done with calm and joy. My message is to make sure that each pose is a pose will flatter the baby’s shape and will bring out the emotions of the day, and make sure that you listen to the parents’ voices. Let me know what you think about these poses and what your favorite one is.